Don't Get Banned from Selling on Amazon; It Could Be Forever! With sales on Amazon.com for the third quarter of 2015 being over $25.4 billion, selling your own branded merchandise on Amazon.com is a natural extension for many businesses in addition to their own website. However, when selling on Amazon.com, Amazon holds all the cards. Their decision in regard to sell your merchandise can sometimes seem arbitrary. This article helps to illustrate how important it is to follow their rules and guidelines. Amazon.com offers small businesses and entrepreneurs ready access to a huge customer market for their goods. Of course, sellers pay a price for the opportunity to trade on Amazon's good name, Internet saturation and global market reach. Not only do private sellers often find themselves in direct competition with the Internet behemoth for products and services, but Amazon holds all the cards. To protect its own reputation and maintain a satisfied customer base, Amazon's sellers' agreement and myriad rules stack the deck firmly in Amazon's favor. In order to sell on Amazon.com, sellers must follow an exacting list of expectations that dictate how and when they interact with their customers at every point in the sales process. Fail to meet Amazon's performance expectations and you could receive a not particularly cheerful "Hello from Amazon.com" letter notifying you that your account has been blocked and your sales listings terminated. And, by the way, Amazon will be hanging onto your money for the next 90 days to cover any unresolved financial issues. For businesses that rely on Amazon.com as a primary conduit to customers and order fulfillment, receiving one of Amazon's computer-generated "Hello" letters can spell disaster. A big part of the problem is that the letters are computer-generated. Computer algorithms don't care if you didn't respond to a customer within the required 24 hours because you were hospitalized or on vacation. They're completely unsympathetic that your approval rating appears to be in the toilet not because you provide poor service but because the only customers who have bothered to offer feedback are dissatisfied ones. Many Amazon.com sellers complain that they've been unfairly booted off Amazon because they've fallen victim to the "law of negative averages" in which a small number of negative comments can, if they outnumber positive feedback, result in a negative feedback score. For example, if out of 50 sales, 47 customers are satisfied, but only 1 posts positive feedback while 2 dissatisfied customers post negative comments, Amazon's trackers will record a negative average and you'll soon be the recipient of a letter from alliance@amazon.com, Amazon's enforcement department. What sends sellers into a panic is the phrase "the closure of an account is a permanent action," implying that you will be forever banned from selling on Amazon. And the ban will not only affect you, but anyone Amazon's online trackers can connect to your name, street address or email address. All is not lost, however, sellers can petition Amazon for reinstatement and a number have done so successfully. The process is not easy; and, if reinstated, you can expect Amazon to scrutinize your account carefully for some time (and hang onto your money while they do so); but you can get back in the game. Look carefully at the points made in the letter you receive from alliance@amazon.com. Review your consumer metrics to see if you're falling short of expectations. If you've failed to meet Amazon’s performance targets, review your sales practices and provide an action plan to correct the problem. Monitor your email for Amazon's decision. To prevent being terminated, keep a close eye on your email and regularly review Amazon's agreements and help pages as Amazon may change its procedures and guidelines at any time without notifying sellers. Monitor the customer metrics Amazon provides and compare your performance to the Amazon's seller performance targets to make certain you are hitting the expected benchmarks. 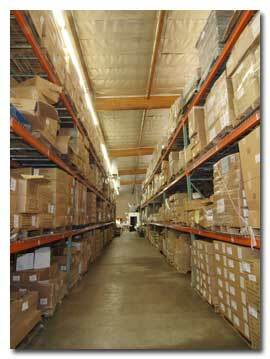 Warehousing, Inventory Management, Order Processing, Pick & Pack We Do It All - Just Ask Us! With our close location to the Port of Los Angeles, we are uniquely situated and ready to receive your overseas container goods, prepare them for distribution, and complete your order processing and shipping needs. Why use services on the east coast when our facility is located so close to the Port of Los Angeles terminal? We offer a wide variety of services, and therein lies our difference from other fulfillment firms. With 25 years of providing fulfillment services for a wide variety of businesses, we understand what it takes to keep your business running. We understand your needs. With our new Quick Books integration and commitment to your success, we become your off-site warehouse and inventory handler; allowing you to focus on selling and marketing your products and growing your business. Why worry about shipping or inventory stock levels when you have Medallion Fulfillment & Logistics to handle the details?